In the Queensland Parliament many issues come forward that directly impact on our first peoples. A Bill designed to stop sand mining on North Stradbroke Island and hand the land back to the Traditional Owners came to the House in 2016. Mr PYNE (Cairns—Ind) (11.23 pm): I rise to speak in favour of the North Stradbroke Island Protection and Sustainability and Other Acts Amendment Bill 2016. Sandmining was always going to end on North Stradbroke Island. It could not go on forever. This bill has a plan to transition from mining jobs to long-term sustainable jobs. With a $28 million investment and a focus on supporting new projects, this proposal will create jobs that can last well past the end of mining. I support a strong plan to stimulate the economic transition of Straddie (ETS). This plan will create 151 direct and ongoing jobs across tourism, education and training and business development sectors. I support the $5 million workers assistance scheme, developed after consultation with the Australian Workers Union (AWU), which will support affected workers transitioning to alternative and diverse employment opportunities through real on-the ground assistance. This will help mine workers with new employment opportunities. In terms of consultation, I note that this bill and the ETS have been the subject of extensive consultation dating back to 2011. Ministers and departments conducted dozens of consultation meetings in the lead-up to the bill’s introduction and the release of the draft ETS in December 2015, including with QYAC, Sibelco, unions, businesses and residents. Consultation on the ETS resulted in 191 completed online surveys, 110 stakeholders provided comments during 22 listening posts or informal discussions on the island and 30 groups provided additional written submissions. During the committee process there were a total of 301 submissions, 1,600 form submissions and 114 witnesses appearing at 12 public hearings, departmental briefings and private hearings over five months of consideration. Member for Hinchinbrook (Andrew Cripps) a fan of mining, but not a fan of Rob. Mr Cripps: Madam Deputy Speaker, I cannot tolerate being defamed like that and I ask the member to withdraw. Madam DEPUTY SPEAKER (Ms Farmer): Order! Thank you for introducing some levity into the debate at this time of night. are no jobs on a dead planet. Capitalism is unquestioned and treated as holy doctrine in this place. It is a doctrine based on infinite expansion through the exploitation of labour and the ransacking of nature. There is another way guided by the knowledge and experience of Indigenous people whose economies are embedded in a classless society and in fundamental unity with nature. In relation to the traditional owners, let me say that the Quandamooka people are a proud people. They never ceded sovereignty of their land and they never signed a treaty with the colonial government. It was, is, and will always be Aboriginal land: people in this place must understand this. When the Campbell Newman LNP government reneged on the existing undertaking with traditional owners, for the Quandamooka people it was—and I quote one traditional owner—’Just like terra nullius all over again.’ For me, tonight is about righting an historical wrong, and I for one embrace this opportunity. The wonderful thing about this bill is that it recognises the Quandamooka people’s connection with the island and it is giving native title justice to this region’s first people. That has been my overriding consideration in supporting this bill. I commend the bill to the House. With the other independent, Member for Cook, Billy Gordon and myself voting for the Bill, it was passed. This would mean an end to sand mining and see land rights returned to the traditional owners the Quandamooka people. Billy Gordon, Member for Cook. 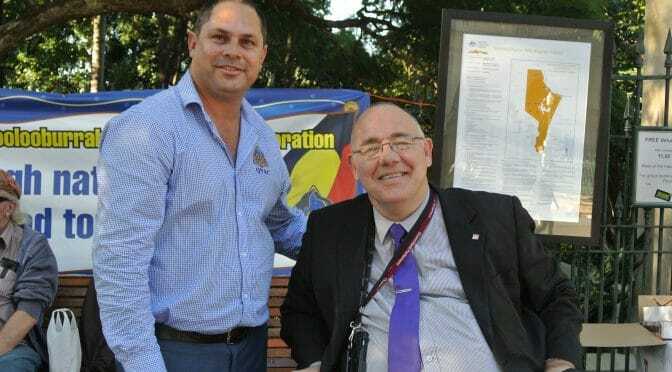 The CEO of the Quandamooka Yoolooburrabee Aboriginal Corporation, Cameron Costello, thanked Billy and myself. He said he looked forward seeing the island, known as Minjerribah in the local language, turned into a global eco-tourism destination. For Billy and myself the thanks and approval of Quandamooka elder Bob Anderson was particularly touching and to have played a key role to deliver for the Quandamooka is something we will never forget. Cameron Costello (spokesperson for Quandamooka people) with Rob. Today, the future for the Quandamooka people is bright. The Quandamooka already run the island’s camping grounds and are employed as land and sea rangers. A new 3.35M Minjerribah Cultural Centre is under construction. The cultural centre will showcase First Nations talent and art across the world. The eco-tourism opportunities are endless and the Quandamooka people are now firmly in charge of their own destiny.